Photo Left-to-right: Wasimaelo, Natalie and Sarah-Kristine Romney. Things were not always easy for Natalie Romney when she first entered the construction industry, a sector that has been largely male dominated, but the SBS Electrical Fire Services Manager is unfazed by stereotypes and lets her ability do the talking. The 50-year old from Boianai and Rabe in Milne Bay Province grew up with her brother and sister, and, looking back, Natalie realises how hard her parents worked to provide for them. “I really appreciate what they did for us and I can say that I had a happy and stable childhood,” Natalie recalled. Natalie started school in Lae, then moved to Fiji with her family before returning to PNG to complete her secondary education in Port Moresby. The single mother of two girls enjoys watching movies, reading and singing, but when she’s at work her mind is always on the job. Natalie has always been determined to provide opportunities for her girls, who are now grown-up with careers of their own. Natalie sparked an interest in electricity as a high school student – from that moment she knew she wanted to be an engineer. In 1992, her dream came true when she graduated from the Papua New Guinea University of Technology (UniTech) with a Bachelor of Engineering and worked for five years with a multi-discipline engineering consultancy firm as a design engineer. Natalie can now look back on more than 25 amazing years in the construction industry – a career that has included involvement in the creation of some of the country’s most high-profile buildings. In the late 90s she worked on the landmark Kina Haus (formerly Deloitte Tower), one of the original office towers in downtown Port Moresby. Natalie’s job was to liaise between project managers and senior management. “You get to walk into the finished product that you were involved in and worked with the people who put it together. That’s interesting – to see something that’s on paper be built around you. Natalie is a role model to her two daughters, who have followed her footsteps in to the construction sector. Her eldest also graduated from UniTech as an electrical engineer and her younger daughter is a drafter, helping to compile documents for complex projects. Two years ago, an opportunity arose that was beyond Natalie’s wildest dreams – the chance to work alongside her daughters on a project of major significance to Papua New Guinea. 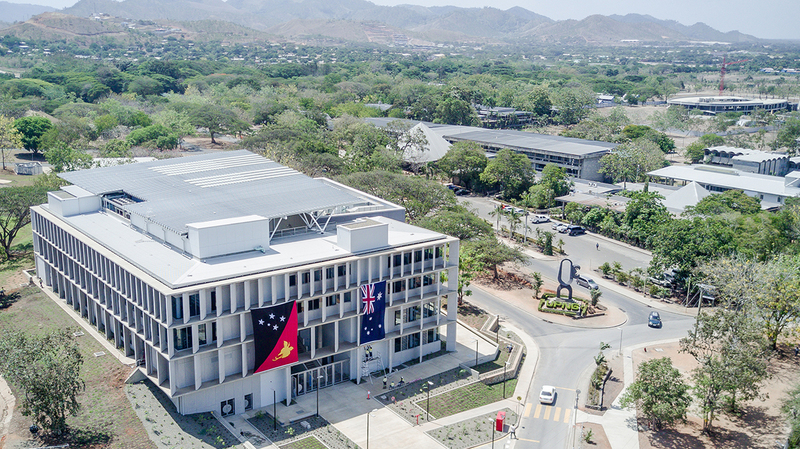 The trio are among more than 300 Papua New Guineans and Australians who worked side-by-side on the University of Papua New Guinea’s new School of Business and Public Policy. Natalie has now led the SBS Fire Services Division for more than a decade and her eldest daughter, Wasimaelo, helped with the testing process for the fire alarm system as the new School of Business neared completion. She knows her kids have the ability to excel in their roles and is looking forward to seeing more and more Papua New Guineans involved in the management of major projects. The new School of Business and Public Policy is a symbol of the strong partnership between PNG and Australia. “For complex projects like this, documentation is really important. Production of the operations and maintenance manuals are a very big part of the project, so both my daughters are involved in that. “My eldest daughter will liaise with the project managers and others on-site to make sure that the documentation is accurate and the testing is complete and that we’re complying with our requirements. Taiko Lalo, Infrastructure Project Manager from the Australian Government funded Technical Enabling Unit, which implements construction projects, worked alongside Natalie and drew on her experience. The School of Business and Public Policy building was constructed with support from the Australian Government, through the Pacific Leadership and Governance Precinct. It is international-standard infrastructure for learning, equipped with modern facilities for teaching, research and collaboration. Natalie believes the School of Business, the new Lecture Theatre and Student Services Building – all completed this year – complement UPNG’s aim of producing top quality graduates who can meet the demands of the modern day. She said the state of art facilities match what UPNG is trying to achieve. “I think it’s exciting for the staff and students to see they have a new Lecture Theatre on the other side and now they are going to have this state of the art building,” she continued. The Precinct, a partnership between Papua New Guinea and Australia, supports generations of leaders – both women and men – who can develop ethical, practical and intellectual leadership for the nation, and promotes the principles of gender equity and social inclusion. 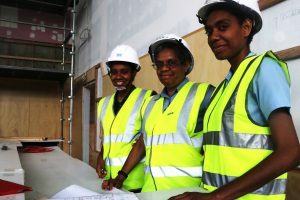 Natalie believes the new facilities are befitting UPNG’s tradition of producing graduates who play a great role in shaping Papua New Guinea’s future. “Thousands of students are going to benefit from these, and maybe their children,” she said. In the years to come, Natalie and her daughters will look upon the new School of Business and Public Policy building with pride, knowing they played an important role in its construction. They might just leave a legacy of their own by breaking down construction industry barriers through their own ability, passion and commitment.